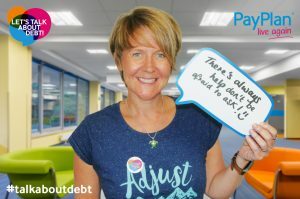 PayPlan, one of the UK’s leading providers of free debt advice is campaigning to break down the barriers which prevent people from seeking help with problem debt and help tackle a mounting problem in the UK. Debt is still seen as a ‘taboo’ subject and many feel they need to hide their problem from friends and family, or tackle it alone. Currently, 8.3 million people (1 in 6 UK adults) are struggling with problem debt, but crucially only 1 in 5 feel they can reach out for help. A recent survey of PayPlan clients showed they were experiencing feelings of being worried (73%), scared (40%), embarrassed (51%) and ashamed (41%) before seeking debt advice. This research highlights the importance of PayPlan’s “Let’s Talk About Debt” campaign, which is designed to normalise the subject of debt and encourage more people to actively seek the advice and confidence they need to look forward to a debt-free future. “For those struggling with debt, the hardest part is often admitting it’s a problem in the first place. Being transparent about struggles to family or a partner is crucial in making sure the situation doesn’t get out of hand. PayPlan is also looking to partners to demonstrate their support for the ”Let’s Talk About Debt” campaign, to help raise awareness across the UK about the importance of removing the barriers to seeking debt help. Identifying the early signs of debt, the reasons that have led to the situation, and getting people to seek help earlier, are key elements in helping people to become debt-free. Visit www.payplan.com/letstalkaboutdebt to find out more about the campaign, including the results of client survey about perceptions of money across different generations, an interactive quiz based on national money related questions, and inspirational client ‘life after debt’ stories. PayPlan is also keen to hear from partner organisations who would like to be involved in the “Let’s Talk About Debt” campaign. For further information and to access free debt advice and support, visit www.payplan.com/letstalkaboutdebt or call 0808 278 9095.